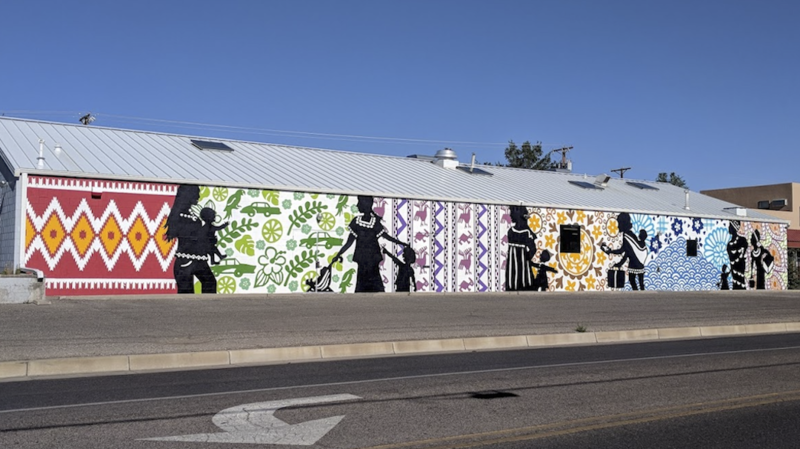 This mural, located at 4400 Silver Ave SE on the west-facing wall, honors the immigrant journey to America and depicts immigrant women and their children in silhouette traveling to their new country, which is symbolized by a welcoming Native American mother and her child. The backdrop stitches together six different colorful textiles from around the world: African ankara cloth, Japanese indigo fabric, Suzani embroidery from Central Asia, a South American weave, a Caribbean print, and a Navajo rug. Kei Tsuzuki and Molly Luethi are two friends, mothers, and printers living in the high desert of Albuquerque, New Mexico. They founded Kei & Molly Textiles, LLC in 2010 to create both a printing studio dedicated to producing artisan-quality fabric goods as well as a vehicle to develop good jobs in the community. They design all their own images, often inspired by what they see in New Mexico as well as by their individual backgrounds: Kei is Japanese but grew up in Montréal and Molly is Swiss American with a Japanese husband. Their product line includes kitchen linens and home & fashion accessories. They both bring a lifetime of experience to this new venture. Kei has printed for designers such as Jonathan Adler and Denyse Schmidt and has shown products at the New York International Gift Fair. Molly’s international background brings a global perspective to her designs and sensibility. She has been a dedicated educator for over 20 years and speaks five languages.